Intel Compute Stick ~ Little Stike. Big Surprise. Compute Mightily, But Carry a Little Stick. 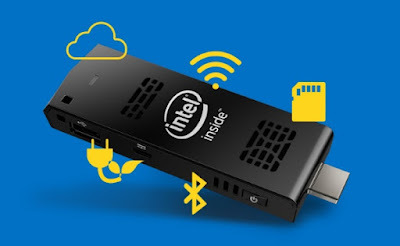 Transform your HDMI*-ready TV or monitor into a fully functional computer with the Intel® Compute Stick. The Intel® Compute Stick. Small, Yet Surprisingly Powerful. While the Intel® Compute Stick can fit in the palm of your hand, it's what Intel® fits inside of it that is truly remarkable. 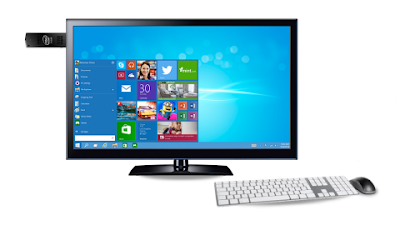 A quad-core Intel® Atom™ processor and your choice of operating systems: Windows* 8.1 with Bing* (with a free upgrade to Windows® 10 after release) or Ubuntu* 14.04 LTS. and comes with McAfee® Antivirus Plus for comprehensive protection from Trojans, viruses, spyware. and 8 GB of on-board storage. 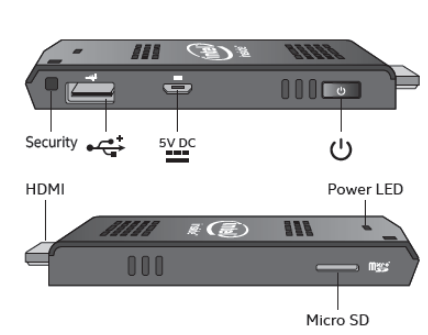 Both devices come with Wi-Fi* and Bluetooth* for connectivity, a USB port to connect peripherals and a micro SD card slot for additional storage. 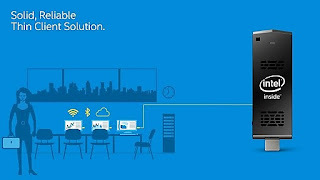 The Intel® Compute Stick transforms any HDMI* TV or monitor into a full computer, allowing you to search the web, share your vacation photos, keep up on your email or do any of the tasks that you do on your computer today. All you need is a wireless keyboard and mouse and you’re set. Transform Your Monitors. And Your Business. Whether you need to develop some digital signage, add intelligence to a conference room projector or deploy a room full of thin clients, the Intel® Compute Stick has the right blend of performance, cost, and size to do the job. Plus you get to choose the operating system that is perfect for your situation: Windows* 8.1 with Bing* or Ubuntu* 14.04 LTS. Wherever you need to add a basic computer to run your business, the Intel Compute Stick has you covered.